We make a lot of foamcore mounted event signs every year about this time, graduation season being what it is. 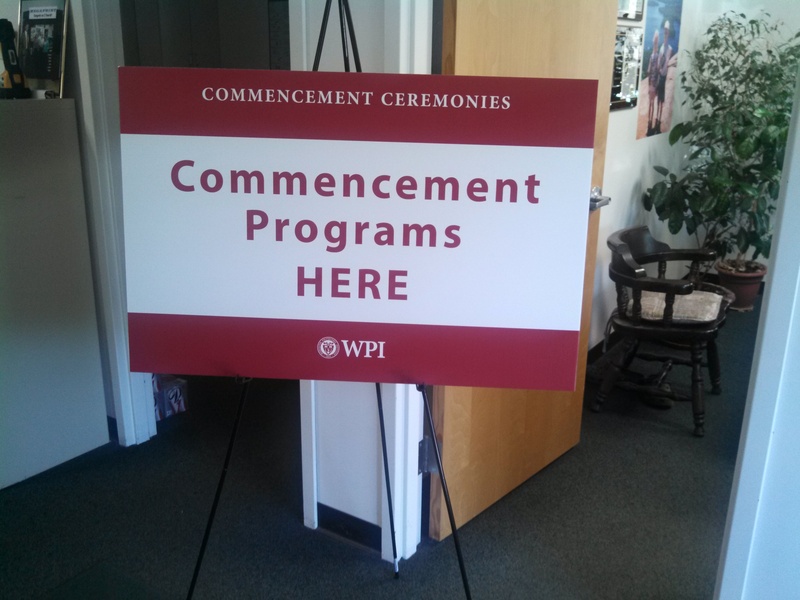 This year the people at WPI wanted graduation signs that could be used year after year. We suggested that they use Ultraboard, which is like foamcore except it has plastic on either side of the styrofoam, instead of paper. That means the event signs are more durable, and that they won’t warp with changes in humidity. These signs can get wet, and you can wipe them off with a sponge or damp cloth. We direct print on them with our UV curable printer which makes them tough and stable in sunlight. While Ultraboard signs are a little more expensive than foamcore, they should last for a lot of years, making them less expensive for the long haul! This entry was posted in Flatbed printing and tagged graduation signs, meeting signs, school signs. Bookmark the permalink.